I recently shared a fun countdown to Halloween. Since it's nearly November already, I quickly jumped on making a countdown to Thanksgiving for Mr E. I still can't believe it's almost November!! Where did the year go? 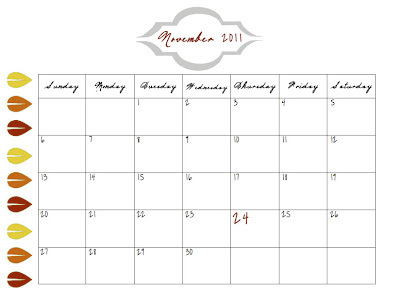 Definitely a busy one and I am so excited for the holidays to arrive and for us to be settled in our new home. Enjoy the November printables and be sure to enter the Shabby Apple Giveaway!! Be sure to download the counter icons to help countdown to the big day! I have included a download for leaf icons or some fun kid-friendly turkeys! thank you!I love free turntables ,especially really cute ones like yours ! !nice blog!